Can you smell it? That's the smell of a crime about to happen. That's the villainous stench of bad guys like The Joker and The Penguin, just waiting to turn Gotham City into their own personal playground. They want to run wild at the expense of the innocent citizens of the city. Well, not on Batman's watch! He fights villains with sweet Batsuit, an awesome car, and a gravelly voice. Perhaps your child could fill Batman's shoes. He might not be able to drive the Batmobile just yet and he might have to work on his gravelly voice, but we can definitely help him with the Batsuit! 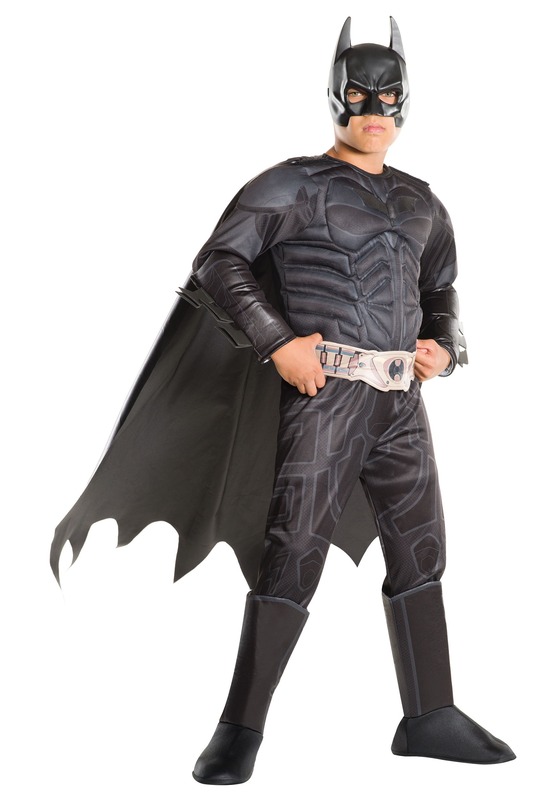 This Batman Dark Knight Deluxe Costume brings your child the realistic look from the movies. The black jumpsuit has muscle padding in the chest and arms to help give your child the muscle-toned look of Bruce Wayne. It even has printed details on the exterior to help recreate the tactical look of the Batsuit from the Dark Knight movies. Foam boot covers are attached to the pant legs, so your child can wear any pair of shoes along with this suit. The belt mimics the look of the utility belt, using printed details to achieve the style. The cape is pitch black and attaches to the shoulders with fasteners. To top off the whole look, the costume comes with a molded plastic mask that fits with an elastic band around the forehead. It features the tall bat ears and generous openings around the eyes and mouth. When your child suits up in this licensed Batman costume, he'll be ready to tackle the mean streets of Gotham City... or at least he'll be able to hit the streets of your neighborhood for a round of trick or treating!